A gigantic Antarctic ice shelf is collapsing and global warming is being blamed. 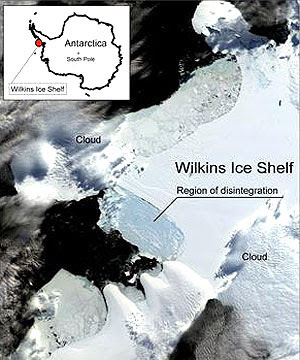 An iceberg 41 kilometres long and 2.5km wide fell off the Wilkins Ice Shelf on the Antarctic Peninsula in late February. That triggered the disintegration of 405 square kilometres of ice. The entire ice shelf - the size of the Hawke's Bay region - is now in danger of disintegrating. The destruction was captured in satellite pictures from the National Snow and Ice Data Center in the United States. Once these ice shelves go, it allows the glaciers that are connected to them to run completely to the sea, the great meltdown has begun and much more rapidly than has been predicted and it’s only getting faster, where are those climate deniers now? Are they still hanging with the remaining people who still argue Iraq can be won? As our Agricultural industry gets away scot free without paying for the pollution they cause and politicians pay lip service to change, it all reminds us how important that Greenpeace action this week to stop coal ships from leaving really is, and these protest actions are going to become more and more necessary. Antarctica as a whole has been cooling since 1965, although there has been some warming on the Antarctic Peninsula. In fact, the IPCC itself recently reported that: "Antarctic sea ice extent continues to show inter-annual variability and localized changes but no statistically significant average trends, consistent with the lack of warming reflected in atmospheric temperatures averaged across the region" and "Current global model studies project that the Antarctic ice sheet will remain too cold for widespread surface melting and is expected to gain in mass due to increased snowfall." But of course Bomber is entitled to practice the religion of his choice. you really think them blocking the harbour for a couple of hours achieved anything? it has achieved nothing at all; and should they continue it will continue to achieve nothing but a newspaper story..but they havent stopped the coal ship; they wont stop the coal ship and continue to be a toothless organisation. Blair, Blair, Blair - do you also note the IPCC didn't include any melt from Antartica because they believed it was so stable and that several reports out late last year refuted that? Please keep up with the debate ole chum, you're sounding a bit hollow these days. Actually, your all wrong. with the new free trade agreement and china being able to let anyone they wnat into our country, the iceflow has decided that its chances of gaining residency in new zealand are now higher than ever before, and therefore is on its way to immigration as we speak. Why must you always hate on foreign visitors? "Climate deniers"? People deny we have a climate? Question: How'd it get to be an iceberg in the first place? But before our "warming" surely the entire ice shelf remained as one lump? Is this a factual admission that there have been warmings before? Thankyou for reporting this, lads. Wow that's a huge chip on your shoulder, I note you didn't post this on the blog where I attack Air NZ over their sick under paying of their Chinese workers? Of course there has been warming before, we've had massive build ups of C02 in the atmosphere when prehistoric forrests covered all the planet, creating over millions of years high C02 levels which breached tippining points and kicked off out of control global warming. We now face the same danger. Maybe it's exactly the same danger, and we can blame the vegitation again this time? The data shows no correlation between man's contribution to carbon emissions and warming. Furthermore, the data shows that it is CO2 that responds to warming, not the other way around. Oh I've heard about these counter claims spun by the opposite position Rick, we've all seen the debates, and we've all read the counter arguements, indeed we seem to go through them monthly - I'd suggest the wikipedia page on Climate Change to begin with. As for your assertion that it is once again out of control primordial forest cover across the entire planet that is causing global warming, there is - how does one say this - fairly obvious proof that the planet is not in fact covered by out of control primordial forest. Then I'd expect you to be ready with some well-prepared replies, so let's have them. And if you need to repair to wikipedia to get them I'll be waiting for you when you get back. Further, you are now telling us that massive out-of-control forest cover across the entire planet causes global warming. Yet the rest of your wamaholic ilk are telling us that's the solution, not the cause of the problem! Trees consume the wicked greenhouse CO2 do they not? Clear that one up for us. Okay, let's go slow here - when the Earth was covered by nothing but forest over millions of years the CO2 levels built up, we know that Trees breath in c02, but they can also release it when the winter comes and the leaves fall off, and when you had massive bild ups over a very long time you get tipping points occur which cause feedback loops to cause catastrophic and sudden climate change, which is what we are facing now, not because of forest cover but because of man made green house gas emissions. If you want wiki in on this you can fetch it yourself, is what I'm saying. Trees can relese...massive build ups over very long times....tipping points...feedback loops...sudden climate change. That's a big bow you draw, when you state it in full. Add to that the fact that CO2 locked up in vegitation over very long time periods will be burried deeper and deeper under the earth- safely tucked away from the atmosphere, and from you, Bomber. Only eventually will it be released again, through the slow process of geology as it has done in the past. So I say to you- might that process not be continuing today? And if addressing your complex doomsday scenario isn't already too much, can I say something else? The data shows that it is CO2 that responds to warming, not the other way around. Until this is settled your alarmist concerns about tipping points and feed-back loops and Henry Ford are premature. um, dude, this was a joke not a statement! Not everything on here is that serious!